The Seattle area ranks among the richest places in the country. Yet some households are worth little, or nothing at all. Everybody knows how much money they make, but how wealthy are you? Maybe you’ve never given much thought to how much you’re worth, but the marketing-analytics firm Acxiom has some idea. They use a variety of public records and private sources to predict a household’s net worth. Their data show that Seattle is one of the richest places in the nation. The median net worth of a household in King and Snohomish counties is just shy of $400,000, according to Acxiom’s calculations. Median is the middle point where half the households have more and half have less. That ranks our area 10th highest among more than 100 metro areas in the U.S. The median net worth for all those areas is about $110,000, meaning that we’re nearly four times wealthier here. A household’s net worth is the sum of all of its assets, minus its liabilities. Assets include financials — savings, investments, pensions and so on — plus the other stuff, like the house, car, boat or anything else that could be sold for cash. Subtract from that total the amount of debt the household carries — mortgage, car loans, credit card debt, etc. — to determine its net worth. While Seattle is one of the nation’s wealthiest areas, the distribution of wealth here is far from even. The biggest predictor of wealth is homeownership, and the difference in wealth between a homeowner and a renter is huge. The median net worth for a household that owns its home in the Seattle area is nearly $900,000. That’s about 25 times higher than the median net worth for renter households ($36,000). It is a striking discrepancy, but it does make sense. A home is the biggest asset for most people (though not for renters, obviously), and that’s especially true in this area, where home values are extremely high. And since homeowners tend to be older and more established (and typically married), they’ve probably also accrued more wealth through other types of assets, too. Mind you, Seattle renters aren’t exactly doing badly when compared with their peers around the country. Their median net worth is still nearly six times higher than the national median for renters, which is just $6,400. 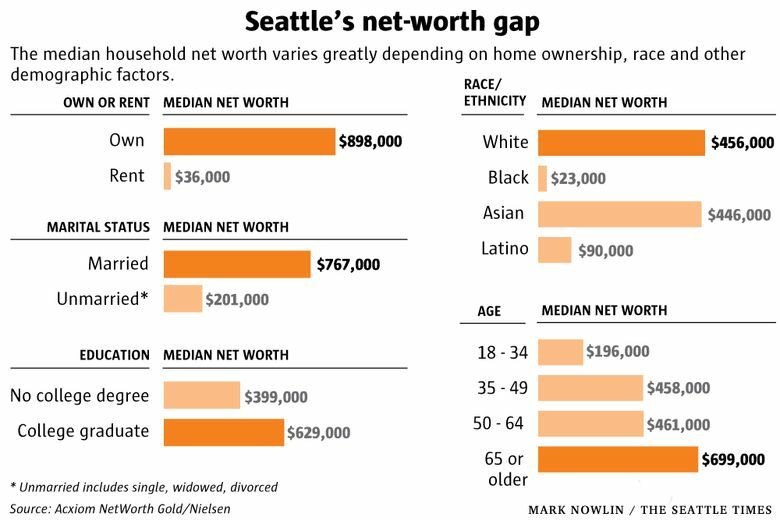 There is a massive wealth gap along racial and ethnic lines in the Seattle area, as there is across the U.S. Households headed by a white or Asian person here have a median net worth of around $450,000. For Latino households, it’s around $90,000 and for black households, only about $23,000. Homeownership plays a big role in this wealth gap, as most white and Asian households own their home, while most black and Latino households rent. In a 2017 column, I looked at homeownership rates for black households in King County and found they were among the lowest in the country. According to the most recent census data, just 28 percent of black households in King and Snohomish counties own their home, compared with 64 percent of white households. The data show that age is another major predictor of wealth. While Seattle has become well-known for its well-paid young tech workers, those high incomes don’t necessarily mean they have amassed much wealth. Many are carrying college debt. They probably don’t own a home and may not have much in the way of savings or investments yet. On the other hand, an older, retired married couple may live on a modest income, but they’re more likely to have gained wealth through a home that’s accrued tremendously in value, as well as savings, investments and other assets. Indeed, the data show that senior citizens in this area have a median net worth more than three times greater than millennials. For some folks, of course, their liabilities outweigh whatever assets they might own. It’s not uncommon even in our wealthy region. The data show an estimated 70,000 households in King and Snohomish counties have a net worth of zero or less, including one in eight renters. The area with the highest net worth in the country is San Rafael, California — that’s ultrawealthy Marin County, near San Francisco — with a median of $1.1 million. The lowest net worth is in the Brownsville, Texas, area, in the Rio Grande Valley, which has one of the highest rates of poverty in the nation. The median net worth there is just $8,400. 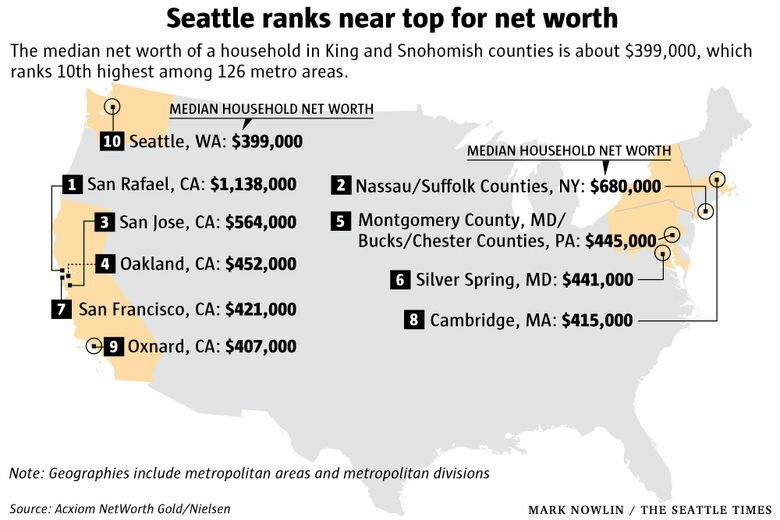 Similar to net worth, Seattle incomes are among the highest in the nation. 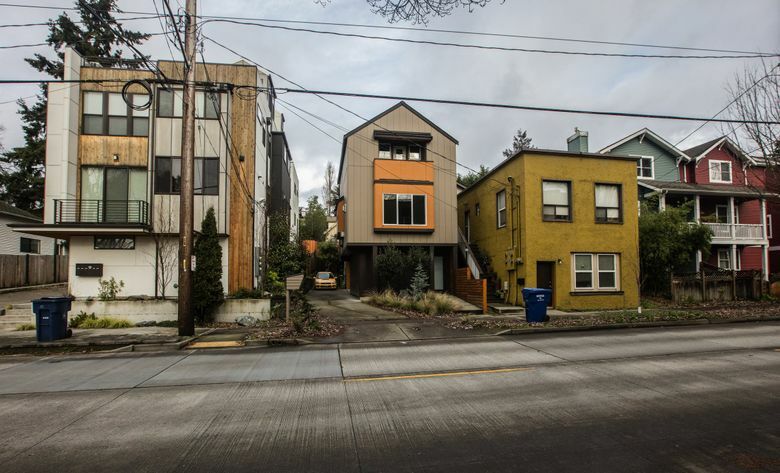 The most recent census data show the median household income in Seattle metro area is $82,000 — that’s 36 percent higher than the U.S. median. Correction: An earlier version of this column misidentified the median household income in King and Snohomish counties. Gene Balk / FYI Guy: gbalk@seattletimes.com; on Twitter: @genebalk.